OMR Sheet is the specially designed bubbled sheet. The term OMR stands for Optical Mark Recognition (Optical Mark Reader). These sheets will be scanned using optical rays, capturing the human-marked data. The aspirant has to mark the most suited selection by darkening the corresponding bubble. A pen or a pencil can be incorporated to shade the bubble as per the marked instructions. For evaluation of OMR response sheets the OMR software is primarily used. This correction process will include the scanning of OMR sheets that will convert the marked responses into digital form. The scanned file is then read through the OMR software. The bubbled sheet is designed using special software assembly. For designing an OMR sheet, the dimensions for each of the bubble can be predefined to maintain the symmetry of the designed sheets. However, the paper size for the most widely used paper types is kept defined as a standard to produce OMR sheets having exact proportions. Each of the bubble on the OMR sheet should be having a minimum of 0.098 X 0.098 ratio of width X height. 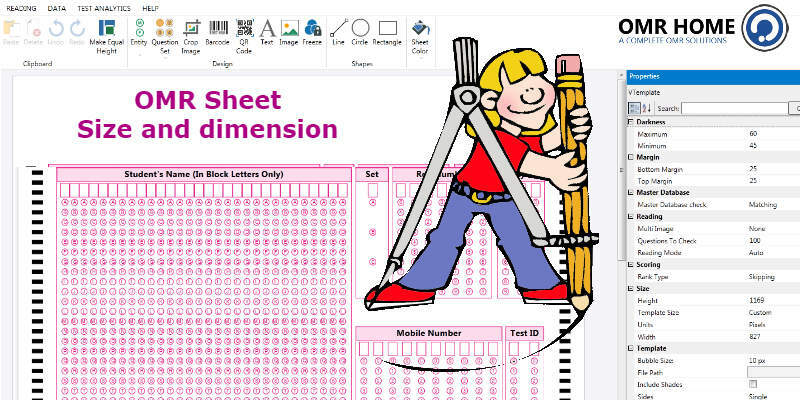 Initially Coral DRAW software was used for designing of the OMR sheets. Now, with the boon in the OMR software technology, it is possible to design a vivid range of OMR sheets. The user can easily define the number of questions, the number of bubbles against each question, mandatory fields like name, roll no, etc. So, design unlimited number and types of OMR sheets to serve the best for examination, recruitment, application, admission, survey, ballot and more. Such a nice article and smart way of presentation. great work. ” Hello! I simply want to give you a big thumbs up for the excellent info you have got right here on this post	I’ll be returning to your website for more soon.